Learn how to start adding shots to your Shot List & Storyboards. You can use the Shot Lists & Storyboard feature to visualize your project scene by scene, shot by shot. 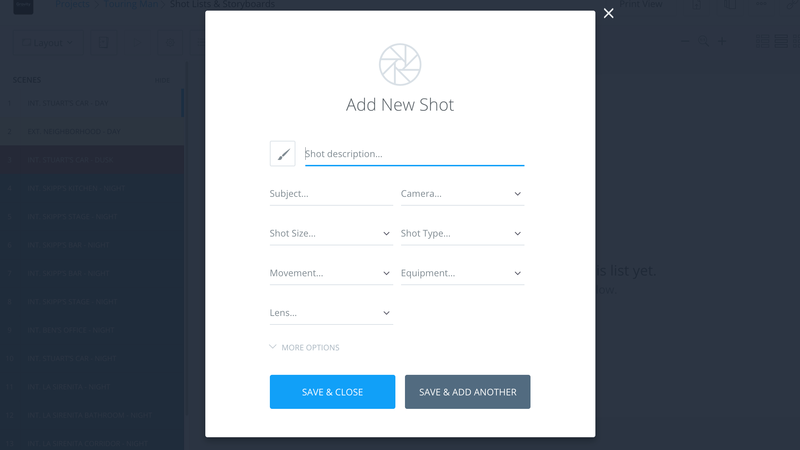 Upload a picture or drawing, giving yourself the ability to show your team what the shot should look like before going into the production phase. This will take out the guesswork when on set. Enter shot details, then click Save & Close. Can I upload video files or GIFs? Currently, you can only upload .jpg and .png files to your shot list. If you're looking to showcase a sequence of moving shots, we suggest adding new shots to showcase this. How can I change or add a custom camera in the shot list? You can do this on the Camera spec, then simply click Custom. Can I move shots between lists? Yes, you can move shots between scenes or between lists. Can I import a shot list from a excel or csv file? Currently, this is not possible! Why are my descriptions in different font sizes? If your font sizes are bolded or big/small, this is due to the format styling being maintained when you pasted into the Description area. To avoid this, simply paste the text into Notepad to remove the formatting, then paste it into StudioBinder. Remember that you can also add notes to your images. This is handy if you need to provide more information than just the image alone.